It is hard to imagine that the dazzling Roppongi of today was a military town but in the Meiji period, the Army infantry first regiment and third regiment were assigned there and Roppongi was an area where the soldiers lived. In 1936, during the February 26 Incident, the first and third infantry regiment took charge. The army was stationed in Roppongi because during the Meiji period, Roppongi was not in the heart of Tokyo yet, few civilians lived there and and they could secure a large area for the army. In the Genroku era of the Edo period, there was a haiku poet, Ransetsu Hattori, who wrote about the serenity of Roppongi and the scenery of the countryside. The countryside remained the same throughout the Meiji period and it was then that the army was formed. 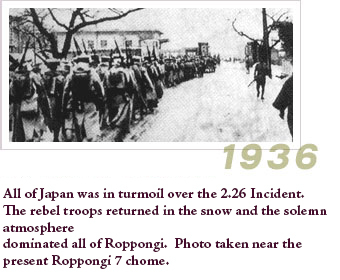 Roppongi continued to feel more like a town for soldiers through the Sino-Japanese War and the Russo-Japanese War. Roppongi was transformed after the second world war ended on August 15, 1945 when the American military came to occupy Japan. The Japanese army base was confiscated and the American military stationed itself there and built temporary barracks, called Hardy barracks (where the Defense Agency building stands now). After the war ended, the town that was once for the Japanese army, became a town for the American military. 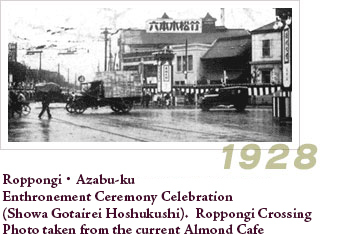 Roppongi began opening bars and restaurants that catered to the American soldiers. Today, there are many foreigners in Roppongi, but it all began with the Americans stationed during the occupation after the war. After 1945, during the occupation of Japan, Japanese people were too intimidated to go near Roppongi because of the American military stationed there. They called this the time of "Tokyo concession". A book by Robert Whiting was published in July of 2000 called the "Tokyo Underworld" (Kadokawa Shoten Publishing company). In this book, he wrote about the relationship between the owner of the famous Italian restaurant "Nicola's" and the Japanese underworld . It was a story distinctive of the "Tokyo Concession" era. The Peace Treaty with Japan in 1952 brought an end to the American occupation, and with the end of the Korean war in 1953, Japan gradually emerged from the post war turmoil and Roppongi slowly changed from the time of the "Tokyo concession" to a place where Japanese people could live. Nonetheless, it still had many clubs, bars and restaurants that had catered to the Americans. Writer Akiyuki Nosaka lived in Roppongi for two years from 1957. In his book "Tokyo Ju ni chigiri" (published by Bungeishunju in 1982), he wrote about Roppongi. "Around 20 bars, low class antique shops, and conspicuous clothing stores with Chinese names were all exclusively for the occupying troops. The Cosmopolitan club near Aoyama 1-chome and the Golden Gate bar in Iikura" still have that feeling of the "Tokyo concession", Nosaka observed. According to Nosaka , the "Cosmopolitan" was the first club in Japan that kept bottles of liquor for its customers, what we call "Bottle Keep" today. As the war with North Korea ended and the American soldiers began to leave, the period of "Tokyo concession" gradually faded. "From 1956, bars and clubs began welcoming Japanese customers"(a quote from "Tokyo Ju ni chigiri"). The first people that went to these bars and clubs without hesitation were the Jazz musicians that used to play at the U.S. military bases. Then the young rich kids that were interested in "America" began hanging out there. In 1959, the American base was returned to Japan and was transferred to the Defense Agency . Also, in the same year, the Japan Education Broadcasting Company (presently TV Asahi) was established in Roppongi. Because of this, people in the broadcasting industry and TV personalities, including the young fans that followed them began to socialize around town. The American era was over and the young Japanese era had began. It was right around this time that the media started to focus on "The Roppongi Family", the young group of kids that hung out until the late hours of the night. It was from the year 1959. Mariko Kaga and Reiko Ohara were some of the young people who used to belong to this group. Getting together at restaurants such as "Hamburger Inn", "Nicola's", and "Kokien" started a social trend that led to the active Roppongi of today. Nowadays, people get together at "Chako", "Shima" and "Misty" . In 1958, the Tokyo tower was built on the grounds of Roppongi and Roppongi was called the "town closest to the highest tower in the world", another reason that contributed to the popularity of Roppongi today. These are my personal memories of Roppongi. In 1958, I entered Azabu Gakuen a private school that was near Roppongi. As a junior high school student, I didn't have the courage to go to Roppongi, but when I got into high school, I began hanging out there with my friends. But to tell the truth, I didn't go to Roppongi to hang out. I went to get a glimpse of the "Roppongi Family" and out of curiosity for the town, like a tourist. In 1961, Mari Watanabe's song "Tokyo Dodonpa Musume" became a big hit, and all the young people who danced to the song flocked to Roppongi. They were like a second "Roppongi family" so to speak. The book "Roppongi Shinju" (1962) by Saho Sasazaya, the story of a young boy and girl who meet at a Chinese restaurant in Roppongi and commited a double suicide, became the hot topic of conversation of that time. 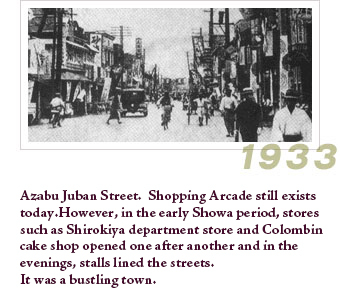 From around that time, Roppongi transformed from the "Tokyo concession" to a town for the younger generation. Another change that affected this town was the opening of the Subway Hibiya line for the Tokyo Olympics (1964). 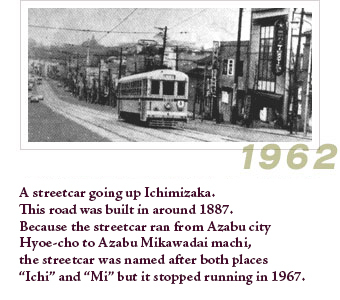 Until then, even though there were buses and streetcars, they didn't have a railway system in Roppongi. There was a railway system in the center of Tokyo but it was not convenient. After the opening of the Hibiya line, Ginza became closer, and Shibuya did, too, even though you had to change trains, it became closer than before. With the opening of the Hibiya line, more young kids hung out in Roppongi. In the 1970s, there was an increase in the number of discos and go go cafes and Roppongi became an entertainment town on the same level as Shibuya and Shinjuku. In the 1970s, the hard boiled writer, Arimasa Osawa, lived in Azabu-juban during his students years. So his hang out was Roppongi. 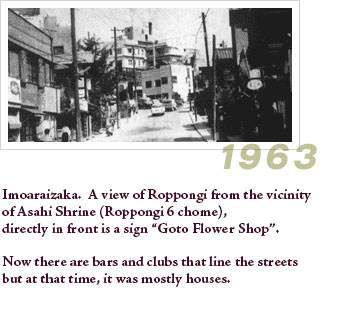 In his " Roppongi kiwai" essay, he wrote about the Roppongi of that time. "As such, I often went through Roppongi but not to commute to school. During the first disco boom, when the U.S. Navy ships arrived in Yokosuka, the discos would be filled with American soldiers. I would try really hard to learn the newest dance moves so that I could talk to the girls." Arimasa Osawa commented on the exciting Roppongi of the 1970s as "every night was like Christmas Eve". 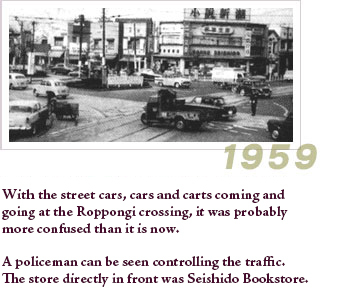 This can be said of Roppongi even today. In the 1980s, Roppongi transformed again. AXIS, Forum and other fashion buildings were built. And with the opening of movie theaters, bookstores, and CD shops in a mixed AV space as well as the WAVE, a new stylish, intellectual element was added to Roppongi's pre-existing pleasure-seeking element. It is not around any but WAVE especially played a big role in this change. As mentioned before, Roppongi has a history of a town for the Japanese army, a town for the US military and a town for the younger generation, but there is actually one more hidden side to this town. 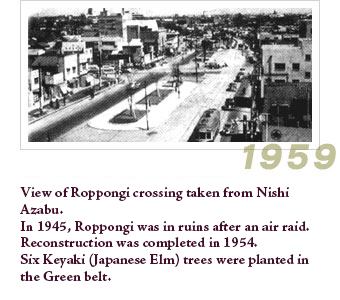 And because it has such a busy main street, it may have been forgotten, but Roppongi was actually a quiet, residential area. Since it was on the outskirts of Edo, after the Meiji period, aristocrats and entrepreneurs built huge mansions there. Today, around Torii Hill where the Toyo Eiwa Girls School is located, you can see a trace of what it used to be like . With the presence of the Swedish, Finnish and Spanish embassies and many more, it is a reminder of the residential district that used to exist. In his later years, Yukio Mishima wrote "The Sea of Fertility tetralogy", four books based on the aristocrats that lived in the mansions on Torii Hill. If you read about pre-war "Azabu-ku History" during the Meiji period, in the area surrounding Torii Hill, there were amazing mansions where relatives of the royal family and aristocrats lived. If you take a walk on Torii Hill today, faint reminisce of that time still remain. In recent years, I walk around Roppongi more than I did before. This is because there has been an increase in movie companies in the area such as Buena Vista International Japan, 20th Century Fox, and GAGA corporation. I go out to Roppongi once a week to watch the advanced movie screenings that these companies hold. To be honest, I only thought of Roppongi as a place to have fun in clubs and discos but after I started going to the movie screenings, my image of Roppongi began to change. An army town, a town for the U.S. military, a town for the younger generation, and a transition town may be transforming into a new media town. After watching a movie screening at Fox or GAGA, I sometimes walk down the hill to Azabu Juban. When I was in high school, I remember going to the Toho movie theatre and have fond memories of watching Akira Kurosawa's movie "Yojinbo". Among the stylish boutiques and little shops, it was so nice to see the yakitori shop was still there and the same as it used to be. I suddenly decided to pop in and I had some yakitori and a beer. In the middle of this new space, some of the old town still remains. This is what makes Roppongi so great. TEXT : Written by Saburo Kawamoto / magazine "Seven Seas"